I want to apologize straightaway for capitalizing on the baffling, yet wearisome global conversation happening around the color of a dress that was buzzing on the web last night (and if you’re reading this months later, I apologize for referencing something that has long been relegated to the dustbin of internet disinterest), but I think that the experience of cognitive dissonance (and indeed questioning of objective reality!) between those people who perceive a white & gold dress and those who obviously see the fabric as blue and black is analogous to what many of us at the Rethinking Hell project have experienced. I tried (and may have failed) to explain this in my Preface to our book, Rethinking Hell: Readings in Evangelical Conditionalism, but my own obsessive interest in studying the topic of hell (which, I mean, why would ANYONE make this an object of 20 years of study??) comes from a very similar experience to those who see different colors in the dress. How can we be looking at the same thing, but see something completely different? After a successful and inspiring first conference in Houston last summer, we are looking forward to the prospect of more conferences both in the US and abroad! 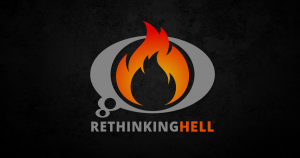 We are pleased to now announce the second Rethinking Hell Conference, which will take place at Fuller Theological Seminary in Pasadena, California from June 18-20, 2015. Our theme this year will be “Conditional Immortality and the Challenge of Universal Salvation.” In selecting this theme, Rethinking Hell is promoting dialogue among evangelicals, by bringing our own view of conditional immortality (also called annihilationism), into conversation with universalism. Universalists believe that hell is a place of purification, out of which God will eventually redeem all who are sent there. This view has gained some popular momentum within evangelical communities since the publication of Rob Bell’s best-selling book Love Wins. As well as the engagement of these two views, our conference will also facilitate a “trialogue” with representatives of the widely-held traditional view of eternal torment. Although some details of the 2014 Rethinking Hell Conference have been in place for over a year, we have only recently finalized the rest of our conference schedule, including breakout session speakers and other details, which we are excited to share with you all now. If you haven’t registered yet, visit our registration website here! DON’T MISS THE EARLY BIRD DISCOUNT! REGISTER FOR THE RETHINKING HELL CONFERENCE BY FEBRUARY 1st!! “ONWARD & EDWARD.” These were the words in bold letters on the front of Edward Fudge’s t-shirt as he greeted me with a warm embrace at the door of his lovely home in a suburb of Houston, Texas, during a brief visit I had with him on a chilly day in late January. He pointed to his shirt and said, “I had this made when I went in for my first surgery, then I took it back out when I went back in for a second and third surgery!” This man does not take adversity sitting down, whether it be severe spinal issues or theological opposition. Register Now! Tipping point. Critical mass. Paradigm shift. Whatever expression you prefer, we believe that a time is coming very soon when conditionalism will explode onto the evangelical consciousness and become a well-known, if not dominant understanding of immortality and final judgment among evangelical Christians. And we feel certain that, if conditionalism finally gets a fair hearing among those people who base their convictions on clear thinking from the Word of God, traditionalism and universalism don’t have a snowball’s chance in Rethinking Hell. Given the momentum that continues to build for this view, we believe that we are at a kairos point in time, that most opportune moment when something special is about to happen, and so we are ready to build upon the work that has already been done by those who came before us and look to the work that lies ahead for our and future generations of conditionalists to do.